Originally released on Profile records in 1989, Youngest In Charge boasts a track list that includes such Hip Hop classics as ''I Got It Made'', ''Taxing'' and ''Think About It'' (remember the video with the hovercraft?). The album, produced entirely by Howie ''Hitman'' Tee, was released when Ed was just 16! 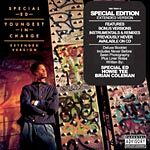 This expanded reissue features eight tracks previously not available on CD and is complimented perfectly with a 16 page booklet featuring extensive liner notes from Brian Colemen (author of Rakim Told Me and Check The Technique). The booklet also includes alternative images from the original photo shoot provided by the original photographer Robert Lewis.